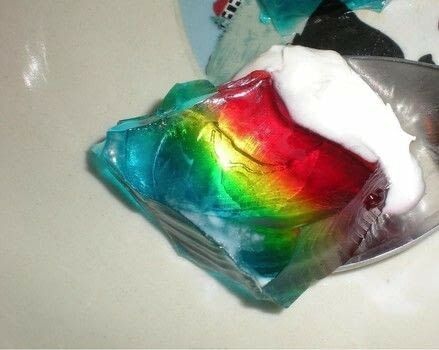 This version only uses three colors of gelatin - red, yellow, and blue - with the addition of three packet of unflavored gelatin. For each layer, use 6 oz. flavored gelatin with one packet unflavored, such as Knox brand. (1st is blue, 2nd yellow, and 3rd red) Stir in 2 cups boiling water until dissolved. Add 1/2 cup ice (around 4ish large cubes). Pour into 13x9 pan, let set for 45 minutes or so in the fridge. Repeat with yellow and red layers. Slice and serve with whipped cream for "clouds". :D This would look fabulous cubed and served in a glass dish. Eating this took me back to my childhood. Who knew that something as simple as Jell-O could be so good!?! This looks great! I love the ideas of whipped cream for clouds.